The attached code does not work for square dance three. If I replace lines 4 to 7 with a right turn, it works fine. I also notice that the waitUntil is in purple. Any suggestions would be appreciated or is there a problem with the robotC graphical compiler with the waitUntil in the repeatUntil loop? The code works in square dance two. 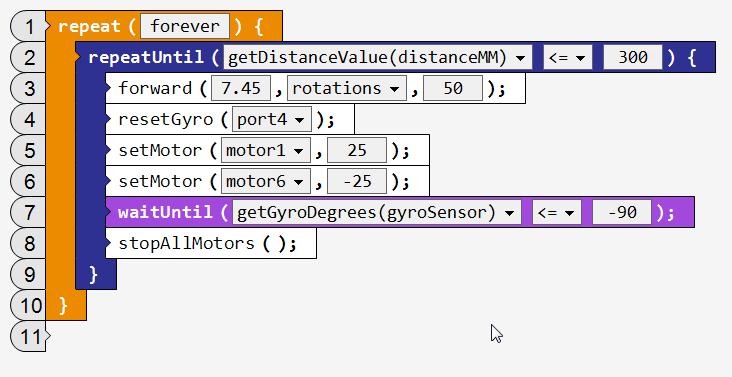 Yes, the code I attached should do exactly what a right turn does, but when compiled and downloaded to a robot, the robot will not execute the right turn using the gyro. The program runs up until the virtual robot starts to turn to the right. It waits for the box to move, starts forward for 7.45 rotations, stops, starts turn to right and goes about 135 degrees, instead of the 90 in the condition. I have changed the -90 to -50 and it still moves the same amount. Once again I was kicked out of posting to this forum when I was logged into the robotC forums. I have a hard time believing the forward command is the problem. Program flow is sequential and the conditions are not checked until the statement is finished processing. You are using the squareDanceThree board in the curriculum challanges to test the code. Also the attached code for square dance two works fine. The only difference is the distance checking condition. The robot waits until the box moves till it starts on its way down the side of the box. I went ahead and placed a stopAllMotors command after the waitUntil command. It solved the issue with the robot over-turning. The robot was being told to wait until the Gyro Sensor had a reading less than -90, but was not told what to do once it received that value. The stopAlllMotors command works. It makes sense that the motors have not been told to do anything else, so they keep turning, even though the robot has rotated the required -90 degrees. I looked in the Q&A and it says that you have to check the keep logged in box otherwise you are automatically logged out after a time periiod. If you take a long time to type your message, you are logged out and have to log back in. Mifght be something you want to mention to the class, so they don't get frustrated trying to compose messages.